War And Remembrance was written by Herman Wouk. War And Remembrance was published by Boston/Toronto: Little Brown (1978). Publisher Boston/Toronto: Little Brown (1978). About Herman Wouk (Author) : Herman Wouk is a published author of young adult books. 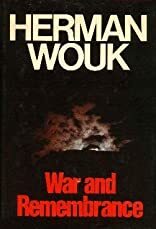 Some of the published credits of Herman Wouk include Don't Stop the Carnival, War and remembrance.